What’s going on ninjas? Are you looking to learn what is the best laser level tripod/stand? Or maybe you want to find out what are those 7 awesome laser level accessories that I have on my list?! These laser level accessories are not complex and do not require so much attention individually! … if you think I should do one in more depth though … let me know in the comments! 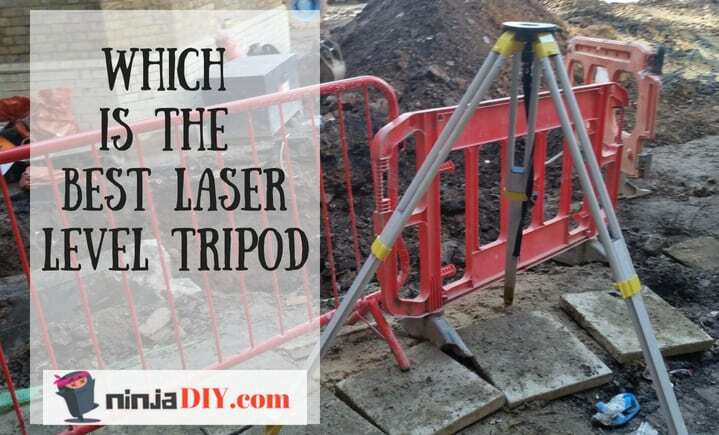 1 Which Is The Best Laser Level Tripod/Stand? 1.1 What is the best laser tripod for my laser level model? 1.2 How To Choose The Best Laser Level Tripod For My Device? 2.1 What To Look For When Buying A Laser Level Receiver? 8.1 How To Choose Your Laser Glasses? Which Is The Best Laser Level Tripod/Stand? You see, the thing is, this is a bad question! Mainly because you have way too many laser level models on the market and you simply can not use the same tripod on all of them. What is the best laser tripod for my laser level model? So depending on your laser level model you can start looking for a laser level tripod that would fit your device. ... you can't just use any tripod on the market, you can't buy a DeWalt light duty tripod or a photography tripod and use it with a Leica 360 laser level and vice-versa. Each manufacturer will have created their own tripods for their own tools anyway, so it's easy. Just go and buy one from the same manufacturer. first of all, a heavy duty tripod. and if it doesn't fit ... is there any laser level adapter that you could use? How To Choose The Best Laser Level Tripod For My Device? This is the most important factor for me when I look to buy a laser level tripod for my device. The dome head type is used more by those who have dumpy levels, transit level. The flat tripod head is the most common one. I guess it is because it's easier to use and you have more laser level devices that you can attach to this type of tripod head. This one is suitable for almost any type of construction lasers, grade lasers, and interior lasers. The second thing I have a look at is obviously ... how high I can set up the tripod. Some tripods will be too low for you to work and do your measurements properly. You should go for a tripod that can adjust the height and the higher it goes, the better for me! Some laser levels are bigger than others, consequently ... most of the times are heavier as well! You can't use a light duty tripod for example for a Leica Rugby 810, since this tool has almost 10 kg (about 20 pounds). So you can only use a heavy-duty tripod in this case. My advice is to check the weight of your laser level device and then check if the tripod you are looking to buy can support that weight. 99% of the tripods I've used are made of aluminum. And to be honest I've been very happy with them so far. They are lightweight and there is not too much to do in order to maintain them. Just clean the tripod with a damp cloth and store in a dry place when you're not using it. A second material that manufacturers are using for tripods fabrication ... is wood! I've never had one, but colleagues on site that used one before are complaining that are heavy and they don't like to carry them around the site. Not to mention when they are getting wet ... twice as heavier! And the third one is made of fiberglass. This kind of tripod is more than 100 times more stable than conventional tripods, and retains this stability in use, without frequent adjustments, in the face of commonly encountered field conditions such as age, wind, fatigue, contamination, wear, temperature, moisture, humidity and anything else that you can find on a live construction site. If you have the budget, go for the fiberglass ... if not, I was always been happy with an aluminum tripod. Almost forgot to mention this one ... the thread on your tripod is very important as well. You can find tripod head adapters on the market that could help you adapt your laser level to your tripod. I guess I'm done with this laser level accessory. 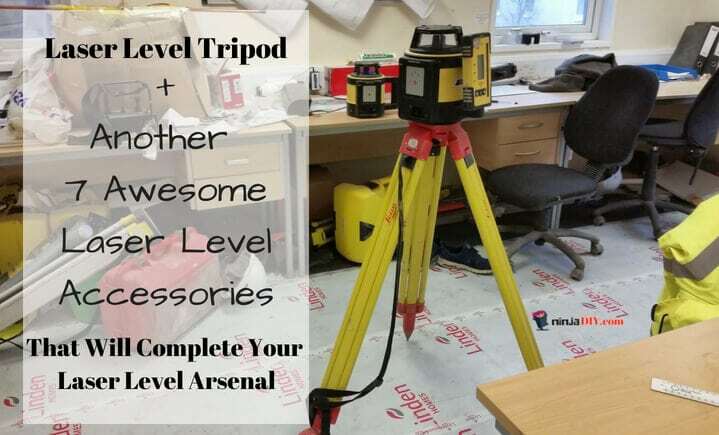 I'm sure you can find what is the best laser level tripod for your leveling device. Cool! BTW, if you have questions, let me know in the comments. I was saying that I have another 7 laser level accessories apart from the tripod for a laser level, right? What is it and what can you use a laser level receiver for? Well, it's just a gadget that helps you find your laser level line when you can't see it. Let's say you work outside, and you are by yourself. As you may know, we have red line laser levels and green line laser levels. The green line lasers are twice as visible as the red ones to the human eye. But even so ... when we work outside on a beautiful sunny day ... it's not very helpful! That is when we will use our laser level receiver. You can find universal laser detector that works with your laser level device, but what I personally like to do is to buy the same brand, I like to have them as a laser level kit, clamp and the receiver, grade rod stick, laser level tripod ... you know what I mean ... the whole kit from the same brand! What To Look For When Buying A Laser Level Receiver? You will have compatibility problems if you don't buy the right laser level receiver for your device. Line laser level receivers will not receive the laser line from a 360 rotating laser level and vice-versa. These laser levels have different operating frequencies...so if you have a red line laser, DON'T BUY A LASER LEVEL RECEIVER THAT WORKS WITH GREEN LASER LEVELS. So, in order to make sure you won't mess up with your decision ... go with what the manufacturers are recommending for your laser level device! This is a very useful laser level accessory. You can use it if you are in the construction industry for example for installing a low ceiling and other drywall applications. And if you are a home improvement DIYer and love to do bits and bobs around the house, you could use for example to hang pictures on your wall or shelves. It's not too much to say about it ... just that you should make sure that laser level wall mount can take the weight of your laser tool and another thing that comes to mind is to make sure that you actually have the same thread size or you can find a thread adapter. This little laser level accessory I've seen my colleagues that works with the drywall using it quite a bit. Previous drywall installation, they need to install the metal work that will support the drywall. That is where I've seen the laser level target/card to be used. But nowadays, these guys are using green line laser levels now and that helps a lot. Especially when they are working indoors. It's good to have one laser target card in your toolbox anyway. It's not expensive at all! How using a laser level target card could help you see better your laser level line in daylight. This laser level tripod adapter is a handy little accessory to assist you in connecting your laser to your tripod. Sometimes, you'll find that your laser level has a different connection than your tripod. This little accessory allows you to use a tripod, for example, with a 1/4" male thread with your laser that has a 5/8"-11 female thread and vice-versa. It's easy to use with just a simple twist. Just read the description of the tripod adapter before you buy it! Honestly, it's very easy to understand! The telescopic pole is great if you don't like to screw your laser level into walls when you work for example on lowering a ceiling ... you just need to extend your telescopic pole and you can place your level on the supports that come with the stick. Again, with this laser accessory, before buy one you need to make sure it can support the weight of your laser level. Oh, and please don't go for the rubbish ones, the cheapest one ... you will regret it. First for losing your time, secondly for wasting your money and the worst case scenario for breaking your laser level due to the lack of quality of a cheap telescopic pole. Looking into a laser level light without protection it could be as much or even stronger than looking into the sun on a hot burning day. ... you should be very careful, DO NOT STARE INTO THE LASER LIGHT! It could damage your eyes so badly that it could cause you permanent blindness. Please avoid this and take care of yourself, use the right tools with the right safety equipment. 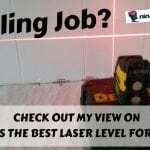 Do I need eye protection if I'm working with construction laser level? ... which basically means that these ones do not emit radiation at a hazardous level, hence, users are generally exempted from radiation hazard controls. Don't stare into the laser light and you'll be just fine! ... in this situation, it will be almost impossible not to make contact with your laser light. Just use common sense, honestly! 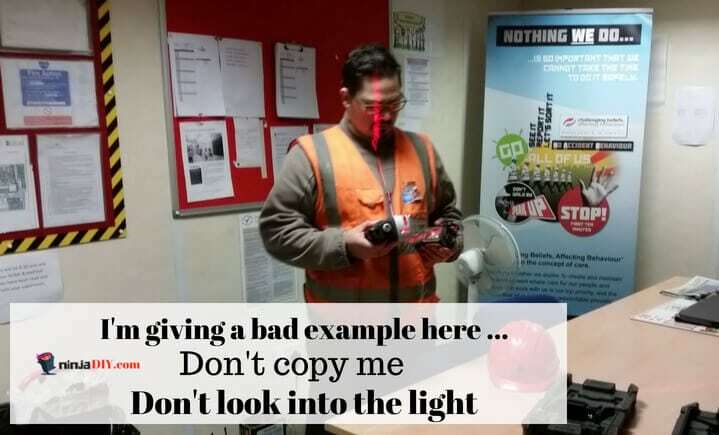 If you think you need to use laser level safety glasses ... DO IT !!! Don't think about what others say, your safety is first! This is my work ethic. If in doubt ... apply all the safety measures that make sense! I don't believe you need to use laser glasses when using construction laser levels, only in some cases where, as mentioned above ... you can't really avoid it! Anyway, here is a cool video that will teach you a few factors that you need to consider when you are looking to buy a pair of safety laser glasses. How To Choose Your Laser Glasses? Ok ladies and gents ... let me finish this article by telling that you don't have to own all these laser level accessories. The thing is, if you are a DIYer, this could cost you some serious money to acquire...but you don't really need to. 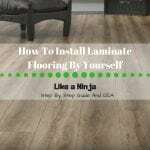 The best advice I can give for my ninja DIYers out there is that if you have decided to buy a laser level ... go for a laser level kit. Usually, these kits come quite complete with a laser device, a tripod, magnetic bracket and even the telescopic pole. You might pay a bit more but it will save you money in the long run. As we have seen ... what is the best laser level tripod was not a good question. If you already have a laser level from Bosch for example just go and buy a Bosch laser level tripod. Save your time, money and energy on buying the rubbish ones available on the market. Hope this article helped you learn something new today! Any questions?! Drop me a message and I'll try to help you out.